Let's suppose that you are a photographer or a person who is very passionate about photography. In this case, your hard disk is probably full of different kinds of photos. When viewing one of these photos using the Windows default image viewer, some of them can lose their glow, even the most beautiful ones. That's because the Windows image viewer lacks a lot of features and the same goes for the Windows slideshow function. Both of them should be replaced by a 3rd party application for viewing photos. One of them is Visions. This simple Windows application allows viewing photos in 3D and also displaying a slideshow of them. After installing the application using its simple Windows installer and running it, the user will be asked to enter the path for the photo folder. 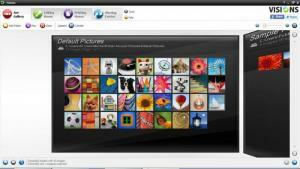 The program allows adding several photo folders at the same time into its interface. After completing this step, the user will be able to view all the added photos in 3D and can also display a slideshow of them. Viewing all the folders in 3D will make it very easy to find a desired image, even if there are many of them stored on the computer. Besides displaying a wide range of image formats, Visions can also edit pictures. Using this feature, one can easily fix photos, by correcting their brightness, contrast and other related characteristics. Besides that, there are numerous effects that can be added to photos and the program offers the possibility to download more from the program's website. What's more, one can create various photo projects, for example, photo books or greeting cards. These projects can be then printed with ease. Supports a wide range of image formats which can be displayed in 3D or as a slideshow. Besides that, it allows editing any image and correcting it, by using a wide range of effects. What's more, various photo projects can be created and printed. The image slideshow can be viewed, but cannot be saved as a file, for later viewing. Visions allows you to view all your photos in 3D and in a slideshow and also to correct them, using a large variety of effects. You can download Visions free here.